Plants to 15(-30) cm. Bulbs ovoid, 3-3.5 × 2.5-3 cm, offsets absent, tunics pink. Leaves 3-5(-7); blade channeled, linear-lanceolate, 20-40 cm × 6-20(-30) mm, apex long-attenuate. Scape (15-)30-50(-80) cm, usually longer than leaves. Racemes 40-100-flowered. 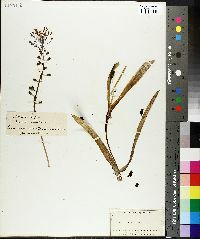 Flowers: perianth tube oblong-urceolate, those of fertile flowers pale to olive-brown, 5-8 × 2-4 mm, teeth lighter brown or white; sterile flowers bright violet, 2-6 × 1-2 mm; pedicel of fertile flowers ascending, 4-10(-15) mm, ± equaling perianth; pedicel of sterile flowers ascending, 6-25(-40) mm. Capsules 6-12 × 6-8 mm. 2n = 18, 27. Flowering late spring. Roadsides, open woods, abandoned gardens; 0--800 m; introduced; Ga., Ill., Ky., Mo., N.C., Ohio, Oreg., Pa., Tenn., Va.; s Europe; n Africa; sw Asia; expected elsewhere.